NEW: The most up-to-date schedule is available using the AIEA Mobile App! AIEA is pleased to announce the 2019 AIEA mobile app with up-to-the-minute information such as the latest schedule, updates from the AIEA, speaker information, feedback opportunities, maps, exhibitor and sponsor details, and more. iPhone and iPad users—search “AIEA Conferences" on the Apple App Store. 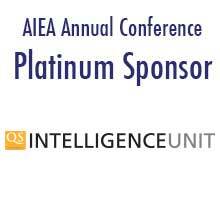 Android users—search “AIEA Conferences" on the Google Play Store. If you downloaded the AIEA Conferences app last year, the 2019 Conference should automatically appear in that app! No log-in required: anyone is able to access all areas of the app upon download. For any changes, please contact Katy Rosenbaum at the AIEA Secretariat. The 2019 conference will take place January 20-23 at the San Francisco Marriott Marquis. The times below are in Pacific Standard Time. Schedule subject to change.